I’ve been having some great success with Twitter lately. As I mentioned in my previous posts, I’ve been focusing in on my ‘thick’ sites and moving away from my ‘thin’ sites. While developing that ‘thin’ empire, I was also creating social support for those sites, primarily via Twitter. Over those years, I have many accounts that have gained a great amount of followers. Some of those followers are what I call ‘low value’ followers, because engagement was low – again, the lameness of thin sites, but some the accounts have great followers associated with them. I manage all of my Twitter accounts with a great tool – Hootsuite. Depending on your accounts, you may need to opt for the paid version. The streams functionality is vital for me to manage multiple accounts, and view streams based on hashtags for great interaction. Hootsuite also has the ability to schedule posts, etc. It’s a critical tool for me. I literally use it every day. Even with the power of Hootsuite, it still involves me actually interacting. I wanted to do some automated handling, which I’ll get into over the next few days. But before we get into that, I wanted to make this post about generating Twitter API keys. I often get asked about this, and people do get lost in this. So I wanted to make this reference post first. Twitter API allows you to connect remotely to do certain tasks with Twitter. You can fetch (read) information or you can post (write) information as a Twitter account. The beauty of this is that you can programmatically post tweets. The first thing you need to do is log into your Twitter account in your browser, then go to https://apps.twitter.com We are going to create a new app, that will give us the ability to do some things, but during this creation, we will have keys. Keys are basically a password to remotely authenticate our program to communicate with Twitter. Fill out the information. 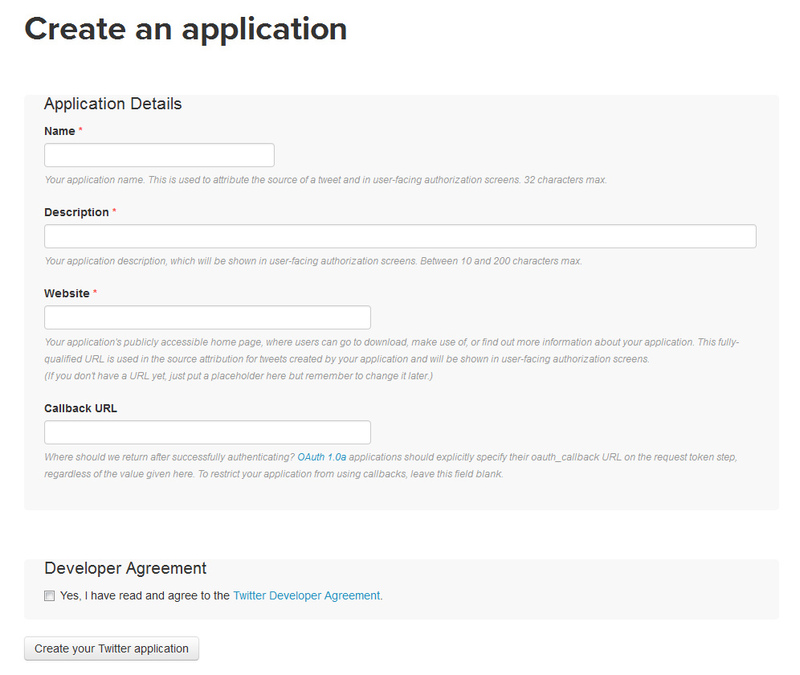 Leave ‘Callback URL’ blank, agree to the Developer Agreement and click “Create your Twitter application”. Now, things that are important. You want to make sure your Access Level is “Read and write”. I believe that is by default, but make sure you check it. If you can’t “write” you can’t “post”. In a secure area in your development you’ll want to copy the Consumer Key (API Key), Consumer Secret (API Secret), Access Token and Access Token Secret. 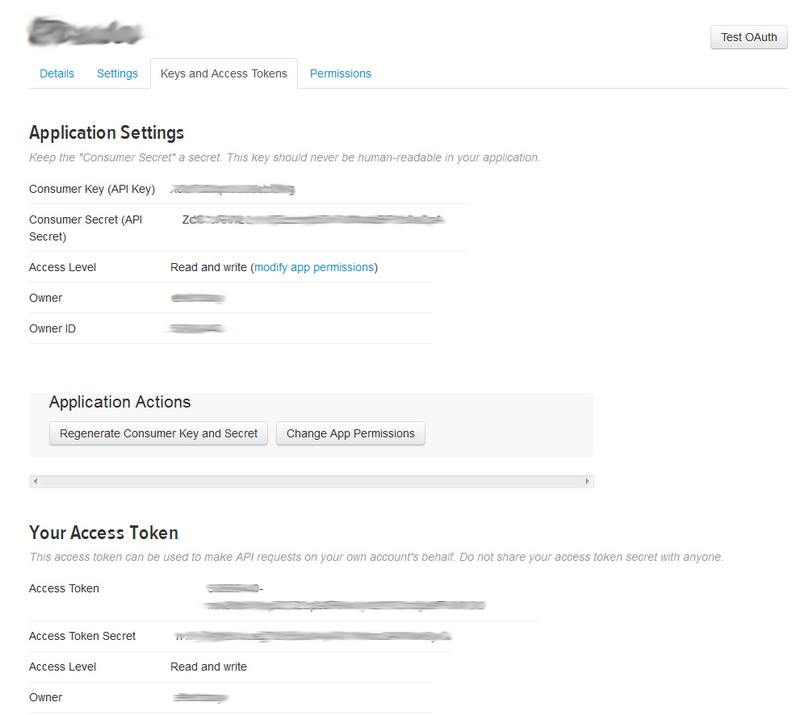 You’ll need all 4 of these to authenticate via oAuth to your program. I’ll stop here, there will be more to come with what I’m doing and some strategies on how to leverage and drive traffic from Twitter to your web resource. In the meantime, I would start interacting on Twitter and start generating followers. So, oddly, I’ve been asked by a few people what Money-Code has been up to recently. I’ve let the site go and completely stopped posting. Did I stop marketing? Nope. Did I stop coding? Nope. What I have been doing is sitting on my laurels. Over the last few years, I created a pretty impressive network of sites earning passive income. Those sites have been focusing on EPN and Amazon earnings for the most part. But, I also have been focusing on my community based sites. I don’t call those passive, since I post or work on those daily, and it takes a lot of time and energy, but there is substance there. Google likes that substance. Slowly over the years.. all the various Google algorithm changes have been eating away and chipping at my EPN/Amazon sites. All of that work creating RSS and API feeds with enhanced searches of auctions and products is viewed as thin sites and in turn most have been de-indexed. 2016 was a clean up year for me. Instead of grasping at sites, wondering how to fix/improve them, I decided to let them go. It was hard, but I’m moving on from those types of sites and focusing on what I have passion in. Sites that I can spend some time on – from a coding stand point as well as from a community stand point. Creating cookie-cutter sites was fun, but what I don’t like, is being reliant on larger organizations like Google or Facebook determining my fate. With a community based site, you have that community and the goal is to grow and nurture those followers and in turn they will share, they will click. In 2017 I will most likely develop 0 sites for marketing. What I’m going to do is work on my community based sites and see where I can go with them. So where does that leave you? Well, I’m going to really focus on how to build community, and that is what I’m going to share with you. In 2016, I’ve been using some tools and techniques that have really helped. The goal is to get traffic first. Once there is traffic, there is opportunity for monetization.